xili-floom-slideshow integrates the Floom slideshow in wordpress theme. Floom slideshow designed by Oskar Krawczyk under MIT license is wonderful and amazing. 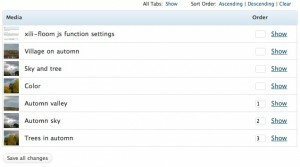 For integration inside wordpress, it can be awesome ! xili-floom-slideshow tries to install it automatically but also allows personalizations. shortcode inside the content of the post, the slideshow of the images of the gallery are automatically displayed. Some properties can be attached to one post by using custom fields. * Minimun knowledges in WordPress architecture (and css). CAUTION: after upgrading, if `floom_subname` is used in custom fields of some posts, to retrieve the images series, the wildcard must be wrapped with one or two chars ‘%’ as in **LIKE** of sql query. – A lot of new properties and features will be soon commented. – xilitheme-select plugin compatibility (for iPhone). – A new demo is explained here. 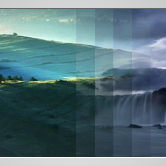 – A example of css and pictures frame (bg image). 1. Upload the folder containing `xili-floom-slideshow.php` and other sub-folders and files to the `/wp-content/plugins/` directory. 3. If you want to personalize the look and size of the frame of the slideshow, don’t modify the default css and files present inside plugin’s folder. Create a floom folder (and a css sub-folder) inside your current theme. Inside this, copy the floom.css, spiner.gif and frame bg image that you can adapt. xili-floom-slideshow plugin will detect automatically this folder. Some **Custom fields** are possible: `floom_divs` to set id of the div containing images ; `floom_captions` (true or false) to display or not the caption (title) of the images ; `floom_progressbar` (true or false) to show (or not) the progress bar. `floom_title_desc` is set by default to 1 and display the title of the attached images. (2 : only the description and 3 : both title and description). * `floom_subname` to sub-select a series of pictures attached by set a mask (use % as LIKE in SQL %img or %pict%…) [See post]. * `floom_container` to inform name of container (default : blinds-cont). * `floom_display` to decide if the container is displayed when no image (block or none) – default : block. As in this website [dev.xiligroup.com], it is now possible to specify a floom.css in each theme (the for desktop, the for mobile as iPhone or iPod). Don’t forget to verify that version of mootools (core and more) are >1.2.2. Is is possible to insert slideshow outside the content of post on CMS ? Yes, xili-floom-slideshow only need to find the id of the div where images are displayed (default name blinds). 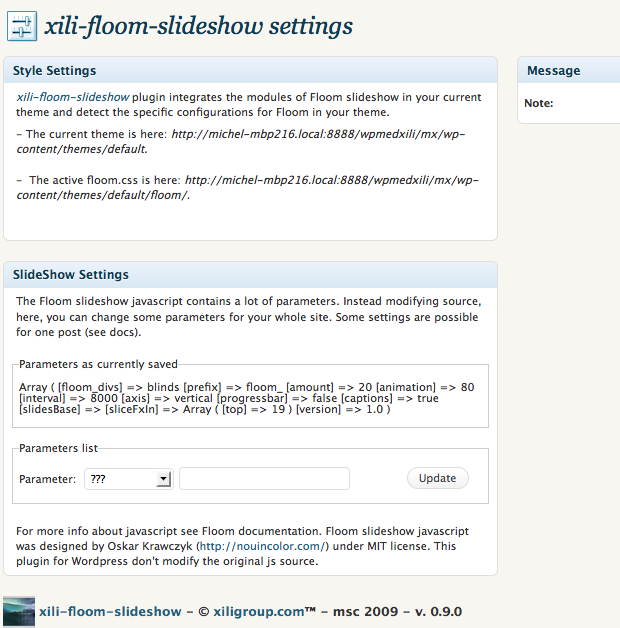 Is xili-floom-slideshow plugin compatible with other plugins based on Mootools ? Yes, but be aware to add a special function in you functions.php. See example [here] (soon). 2. Folder example in current theme. 3. Blinds during transition between two images (snapshot from Oskar example). 4. 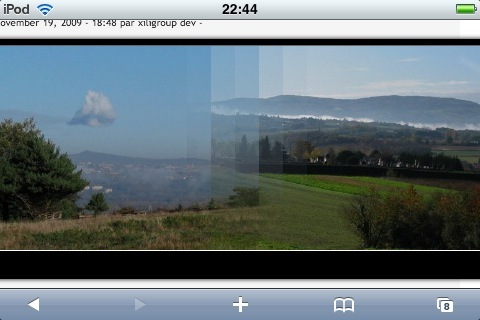 Example in iPhone Safari. 5. Ordered list of images (only these in slideshow are affected). What about fireEvents by Floom ? If a js function called by Floom is named `dothisthing(s)` just add in xili-floom-setting the name `dothisthing` as value of one of the two available fireEvents as `onSlideChange`. (the param passed by floom is the current image object). See this amazing post ! xili-floom-slideshow : the mystery of css revealed ! This looks very nice, but I see no information on where the images come from ? Could you please give me more information on how to do this ? It is very simple: attach some pictures to the post (but don’t insert them in the text of the post) and add shortcode [xilifloom]… You can also attach images of another post but you must set param (floom_parentID) with ID of another post containing images in custom fields. Read carefully readme and doc. Keep me informed. Also having difficulty with your instructions. I’ve activated the plugin and uploaded 3 images. Then I attached them to a page. I put the short code on the page. The slide show is not showing in the header but is visible in the body of the page. have you another plugin working with images ? Is it freebeer web site concerned or another. I see you use WP 2.8.4. Do you have another website ? Normally, the floom slideshow is inserted at the place of the shortcode as inside post about floom – https://dev.xiligroup.com/?p=1301 – (and not as in home of dev.xiligroup). The images must be attached but not inserted. Can you give me the URI of concerned post – I will see source of html with my browser to diagnose ? Use contact form to say me. That’s very kind of you but I’ve now found another plugin which is working. I had the Floom shortcode on a page, not a post. However, I wanted it working inside the Header. Yes the images were attached and the blog was another site running WordPress 3.0.1. Hey I am trying to change the size of the window that the slide show appears in. My theme is custom and the slide show doesn’t fit inside the column i need it to.. Any help? I wanted to you widget for website but encountered problem. I added code : xilifloom_theme_header() in function php, but every has soon error. I can access the web content. loaded the floom slideshow. where do I load pics; what size; how to make display less wide? This post concerns 0.9.3 – please visit the repository http://wordpress.org/extend/plugins/xili-floom-slideshow/ and forum http://forum2.dev.xiligroup.com/ for more infos. The plugin is not totally plug and play for newbies. It need some preliminary works to locate the div where the slideshow is displayed. What’s the difference between attach and insert? I can only insert! what do you mean by attach? My brain is gonna melt!! !